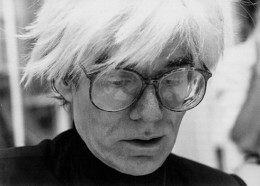 Artist Andy Warhol once remarked in his non-chalant fashion, "art is about liking things". 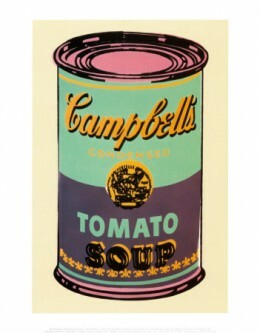 Well Warhol must have been very fond of Campell's soup cans because he painted quite a few of them - 32 in total and all uniformly measuring 510 mm by 410 mm. 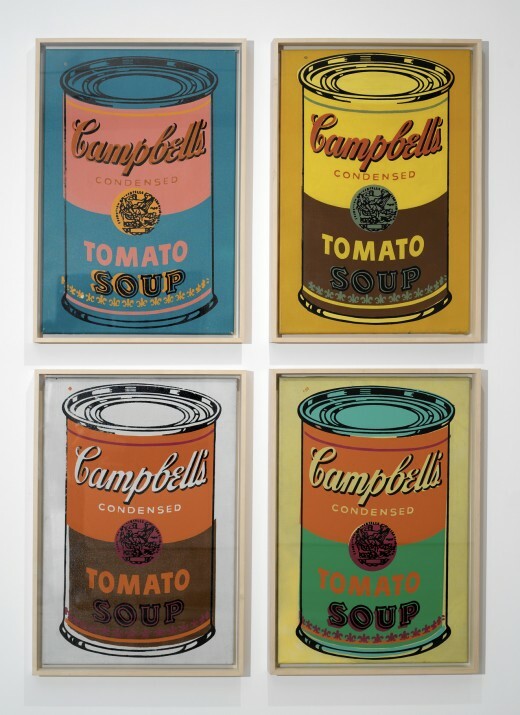 They were created in 1962, using a silkscreen printing method and each can displaying the varieties of soup Campbells had on offer at the time. artist took ordinary objects from popular culture and emphasised them in ways that transformed them into iconic 'art'. By the 1960s,the soup can, in all its glorious mundaneness, had been a familiar object to millions. By removing the cans from a familiar domestic context and placing them in a space normally reserved for works of art he was at once mocking the seriousness of the art establishment and at the same time elevating popular culture to the level of art. The movement known as Pop Art emerged first in England in the mid 1950's and spread across the Atlantic to the US a few years later. During this time, artists became interested in mass media and the consumer products that were being marketed everywhere.The postwar period of the 50's and 60's saw a commercial boom as, after the austerity of the war years, people had more disposable income to spend. Of the American pop Art movement, Warhol is perhaps the most famous...he was a notoriously strange character and it's hard to know for sure whether works like the Campbell soup can series and later his series on Mariyn Monroe are imbued with any sort of cynicism about his contemporary world or whether they come from a certain naive affection and affinity for the world he lived in. They certainly served him well on a financial level. Reputedly, he had a postive view of modern culture and had a tendency to look at everything with an interested, artists eye, however ordinary the sight he beheld. As he said himself, "I like boring things". Andy Warhol had been a successful graphic artist/illustrator who worked in advertising himself; he understood the industry and its nuances. That is, he had a good idea of what triggered recognition in the public psyche. Many of his projects, not just in Pop Art but in film and music as well, were avant garde and challenging - at the very least least they compelled people think about what was going on around them and to recognise the iconic in popular culture. 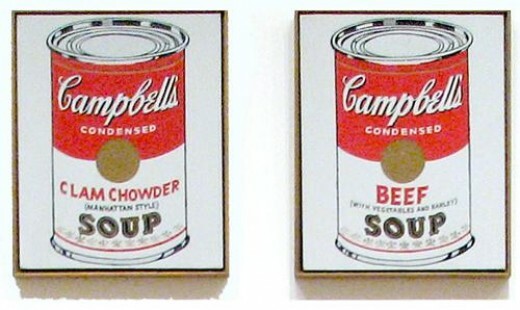 In any case, perhaps because he was the first to paint an ordinary object with such glaring and daring obviousness, the Campbell's soup cans were hugely successful for Warhol, while he was alive and especially after he died. 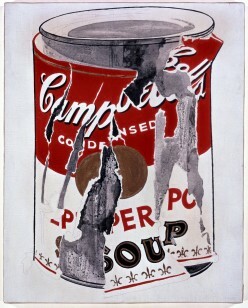 In 1962 you could buy a work such as Small Torn Campbell’s Soup Can for a paltry 30 dollars, yet the same work was purchased recently for $11.7 million..a massive escalation in price.